Whether on the African plain or your living room, cats conduct themselves with a royal elegance and pride. From choosing your first cat, to just looking for answers, Feline Behavior will help you to better understand these complex creatures. Each movement of your cat's tail reveals its mood and opinions as plainly as any words could. How your cat moves expresses not only your cat's feelings, but it also predicts what it will do next. Purring is more that just a sign of affection. When your cat comes across something which it deems a threat. A cat's tail acts as an extension of its thoughts, an indicator of its mood and as a warning of intention. Broad swishing of the tail indicates annoyance. For example, a cat that decides it's had enough petting will signal you by swishing its tail in impatience. If you continue, your cat may "bat" you with it's paw or growl softly. Though usually good-humored, the batting is an act of aggression indicating your cat's agitation. Severely agitated cats will move their tails rapidly back and forth from the base, a clear threatening signal. Generally speaking, the larger and more rapid the swish, the more upset the cat. It is to the cat's advantage to exhibit a visible warning to other cats (and to you), in an effort to avoid direct conflict. Cat's involved in a conflict may extend their fully bristled tail straight into the air and turn their body sideways to appear larger. With prey, though, the tails of hunting cats show more subtle movements, explaining to other cats its intention while not warning its victim. If a cat is afraid or is trying to avoid a confrontation with a dominant cat, it's tail will "puff up" or become bristled. It will then lower it's tail or tuck it betweens it's legs as a sign of submission. Twitches (as opposed to swishes) of the tail display excitement and curiosity. A raised tail, as long as the fur isn't bristled, indicates that the cat is being friendly. If the cat is really excited, as often happens when you come home after a long day at work, or when you open a can of cat food, the upraised tail might begin to twitch with anticipation. The cat will probably next try to talk to her owner, or begin rubbing against her owner. Body language is not just restricted to a cat's tail. 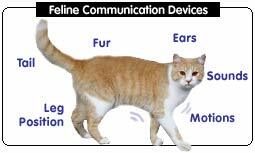 From the way your cat stands to the position of its ears, your cat is saying something. Your cat's legs were not made for just walking around. A bend in the forelegs shows that the cat would rather avoid a fight, but will defend itself if the need arises. When your cat expands its body, fluffing up, it is showing both confidence and aggression. If the cat's legs are stretched fully, it is self-assured and prepared to attack. A bend in the hind legs, however, shows indecision, or even timidity. When a cat shrinks its body size, legs tucked underneath, it's showing submission, as well as readiness for action. A cat's ears do more than just hear, for the ears can talk as well. When the ears are back and the posture is steady, the cat is unsure of what move to make, considering its options. If the ears are back, and the body is low to the ground, this is a display of shame or remorse. The cat's pricked ears show its interest in what's going on around it. When a cat raises its head directly, this is an attempt to display dominance. If the head is lowered, that means submissiveness, or even a feeling of inferiority. When the head is completely tucked in, your cat is probably bored. If it's sneaking around low to the ground at a crawl, it is going after something, stalking its 'victim'. Be aware that the cat will start a full speed assault. Purring is not a part of every cat's repertoire of social communication, yet is one of the most common. Not a great deal is known about the mechanics of purring, but purring is associated with contentment and happiness in cats. Interestingly, though, purring is sometimes heard in cats that are severely ill or anxious, perhaps as a self-comforting vocalization. Vocal cats utilize vowel sounds to indicate their desires, the classic "meow" as an example. The subtle differences in sound communicate commands as well as requests and complaints. In the wild, vowel sounds are restricted to kittens, but the process of domestication has extended this method of communication well into adulthood. With adult cats, there is a level of high intensity sounds that are created by the cat shaping its mouth. Hisses and grumbling are the most common example, used primarily between other cats, as a means of communicating aggressive or defensive intentions. Cats in heat and feral strays also use this form of communication. Even a small kitten can become aggressive if backed into a corner by another cat. As adrenaline kicks in, the "fight or flight" response takes over. When this occurs even a little kitten can be successful at scaring off a larger cat if flight is not an option. Fear, and the fight-or-flight response to it, is an instinctive adaptation to many situations. Fleeing or hiding from a perceived danger has preserved cats in the wild throughout history. When the flight response doesn't work, the fight response is called upon. All cats are capable of this fear powered aggression. Triggering such behavior depends on the cat's fear sensitivity threshold, and the accessibility of hiding areas and escape routes. As long as a cat perceives a threat, with nowhere to run, only then will it become aggressive. Most of the time, cats, even in full fight mode, will attempt to avoid direct conflict through a show of intent. A cat's first strategy is an attempt at making themselves appear larger to their potential foes with hopes that their foe will retreat. With backs arched, claws out, and hair raised, cats lock eyes in a fierce standoff. Hissing and growling, accompanied by the occasional swing of a paw, continues until one cat breaks eye contact, ending the battle of wills. Typically a dominant victor will emerge from an actual confrontation, and the two cats will usually avoid each other. If fighting continues, it may be time to consult a behaviorist.